I've always liked Frosted Mini-Wheats and I was excited to see they had unveiled a new flavor -- Maple and Brown Sugar. Maple is one of a handful of flavors that is nearly exclusive to breakfast. It works with pancakes, waffles and oatmeal, so why not Mini-Wheats? It certainly smelled good as I opened the box. Pouring milk over the toast-brown wafers, I was filled with hope. I let the milk mingle with the cereal a little before I started eating. It gave me a chance to read the box. Suddenly, I was filled with trepidation... "Maple Flavor & Real Brown Sugar Baked Into Every Bite!" Not real maple, it was "Maple Flavor". Only a week earlier, I had reviewed McDonald's McGriddle sandwiches which had maple flavor baked into them. And it tasted like flavor...synthetic and chemical. The bowl of cereal stared at me. I could almost hear the wafers speaking to me as they do in the commercials. The rambunctious sweet side of the wheat biscuits was saying "It's gonna be good Dude." The side without the sugar, with its trademark highbrow accent, seemed to say, "Indubitably, you shall be dismayed." The sweet side was right... Maple & Brown Sugar Frosted Mini-Wheats are good. Once you add the milk, the "flavors" take a backseat to the whole. The maple flavor and real brown sugar add a flare to the cereal without detracting from what made Frosted Mini-Wheats a good cereal to begin with. It is "maple flavor" done right. Truth be known -- if I were offered a choice between traditional Frosted Mini-Wheats and the new flavor, I would go for the traditional version. Truth be known II - if I didn't know there was an earlier variation, I would simply say that this new cereal looks good, smells good and tastes good. What do you think of Maple & Brown Sugar Frosted Mini-Wheats? Love, love, love them! 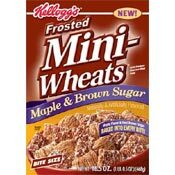 The maple and brown sugar version is the best of the Mini-Wheats cereals. BEWARE! I was shocked to see, after purchasing a box, that this cereal contained Sorbitol, a fake sweetener. It also contains gelatin and as vegetarians, that is off our personal list. For those of you that don't know, gelatin is made from the hooves of animals... that's right their grungy cuticles! I am not feeding my children this junk! Thumbs Up! Husband is a truck driver and this is what he prefers to snack on. Crunchy taste... good and good for him! Just had a bowl. It's such a breakfasty tasting cereal! Yum, yum! I enjoyed it very much! Eating some now as well, they aren't as good as the originals when they slather them with regular sugar, but they do give a hearty amount of brown sugar on these bad boys, making them a close 2nd. Wow, I never would have thought that flavors like these would ever exist! Heck, maple flavor or real maple I don't care! Just give me another box! Eating it right now, I like it, I prefer the original but this is still a tasty get away from the original Mini-Wheats. 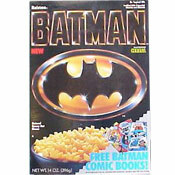 This is one of my favorite cereals. Wegmans has a generic version that is even better because its not quite as sweet and artificially maple tasting. I ate it for breakfast 4 weeks in a row until I was ready for something new. If you are looking for real maple flavor, go to Vermont. If you don't mind the fake stuff, try this cereal! The flavor is undeniable. A Masterpiece of a breakfast though it is filled with sugar. Not the best, but it is very tasty. It sounds like a real winner or at least on the page. I can't wait to try it!